Nearly two million Chinese have backed a proposal that would see the country outlaw the slaughter and consumption of dogs and cats. 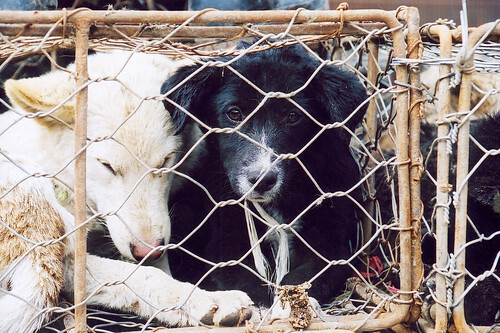 China.org.cn, used for gauging public opinion, was inundated with support for the legislation proposal as 1,901,597 people expressed their desire to see China’s dog and cat meat industry outlawed. National People’s Congress deputy Zheng Xiaohe delivered the proposal banning the slaughter and consumption of cats and dogs to the National People’s Congress at last week’s “Two Sessions”, the annual meetings of China's top political advisory bodies. Media reports following the high level talks revealed that the will of the two million ordinary citizens was joined by 30 other NPC representatives who supported the call to amend the law on food safety to exclude the use of dogs and cats. The proposed amendments would ban the use of non-agricultural animals, those slaughtered incorrectly and those failing to match quarantine standards from being processed and sold for human consumption. The sheer weight of support to the proposal made the issue the hottest topic at this year’s talks, with the second most supported topic being the introduction of laws to punish animal abuse. “The results of these polls confirm what we have been hearing on the ground and show exactly where the priorities of the Chinese people now lie. The eating of cats and dogs is a minority activity which the majority abhor. Specific legislation to protect animals is lagging far behind China’s development and people are desperate for it to catch up. It is expected that Deputy Zhang’s proposal will receive a formal reply within the next six months. Deputy Zhang has vowed in media interviews to continue submitting the proposal as long as he remains a representative of the NPC until the eating of cat and dog is condemned to China’s past.